The Planetary System ( ISBN 080538734X ) gives you a complete overview of the solar system. It gives you a great introduction to watching the sky together with the theory behind orbits, eclipses and the history of major researchers of astronomy. Each chapter in turn in The Planetary System then discusses each planet in turn and other major sky items, such as satellites, asteroids and meteorites. Within each chapter in The Planetary System is what you would see when looking at the object. Seasonal cycles of the planets are discussed, together with the topography and geologic features of the surfaces of the planets. Craters and surface views are also included as are intricate details about the planets atmosphere. The end of every chapter includes a summary with key terms learnt. It also includes review questions, quantitative exercises and additional reading. The Planetary System is quite a large book which contains a lot of information and some great photos and illustrations in a mixture of black and white and colour. The Planetary System includes a lot of theory and some intricate science and formulae. 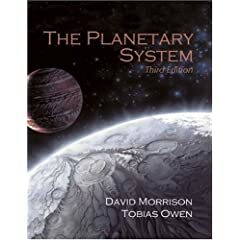 This may be a little advanced for a lot of us astronomers, but the book does give you specific insights into a lot of information about our solar system and our solar systems planets. If you want to learn a lot more about our solar system and the planets then The Planetary System is a great book. The Planetary System also comes with Voyager SkyGazer College Edition software on CDROM.